Because the technical level of Chinese building materials industry is backward, the gravel has not been washed, the dust content is high, the process of storage and transportation is more prone to dust, the dust content is higher in the sand. In the city commercial concrete mixing plant, the closed aggregate field is introduced into the aggregate storage yard. The new building material hollow brick is used, which can not only make the dust not emit in the surrounding environment, but also can reduce the noise pollution. Host adopts sealed package, and aggregate material belt machine also use color steel tile to package, which can reduce the probability that the dust discharged into the atmosphere when transport the aggregate. The negative pressure dust collector we studied (including the desiccant function) can ease the instantaneous pressure and filter the water. The traditional way of removing dust is to install the bag type dust collector on the top of the warehouse, but the effect is general, based on the bag type dust collector to increase the pipe type dust collector, it can filter the atmospheric further. Increasing pressure pump, improving the nozzle structure, forming a water curtain, to suppress dust generated when feeding on the host. For more information about any of our products, please feel free to contact us or at the contact addresses available on this website. 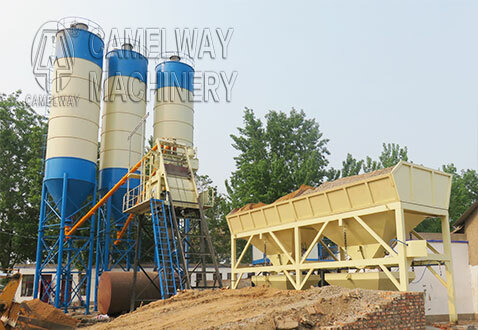 Zhengzhou CamelWay Machinery manufacture also produces dust control device(dust-extraction unit, dust control unit), tower cranes, construction elevators, concrete mixing stations, JS concrete mixers, concrete batching machines, stabilized soil mixing stations, wheel loaders, concrete transport tanks, JZC concrete mixers and other construction machinery.